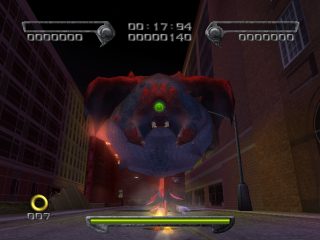 Black Bull is a mini-boss faced after completing one of two Hero levels in Shadow the Hedgehog: Lethal Highway or Death Ruins. On both occasions it is summoned by Doom's Eye in order to subdue a disobedient Shadow. After fighting through Lethal Highway (and potentially destroying the hovertank), Sonic and Shadow confront Doom's Eye in a cutscene, where Shadow explains that he has no intention of following the alien's orders (even if he completed the Dark mission). In response, Doom summons Black Bull; a bat crossed with a giant larval grub, to "Burn this entire city and its inhabitants to ash!". The boss flies around a devastated city block, vomiting fireballs and occasionally being reinforced by Black Hawks and Black Warriors. Bull's only vulnerable spot is his single green eye. Sonic advises Shadow to Homing Attack the Black Hawks in order to gain enough altitude to strike at Black Bull. While this tactic eventually works, a faster method is to attack the Black Warriors, taking their guns and charging the blue Chaos Control meter. Time slows to a crawl and guns have infinite ammo when the ability is used, allowing Shadow to deliver lethal damage unobstructed into the creature's eye. The Black Bull faced by Shadow and Rouge at the end of Death Ruins is the same kind of creature, but the fight arena is very different. Here the Bull hovers in the center of a grind-rail vine, occasionally throwing out circular shockwaves as well as fireballs. Once again, though, he can be defeated by grabbing a gun and shooting him in the eye or by homing attacking his eye, however using a gun is more effective. Out-of-universe, the boss is, like Blue Falcon, apparently named after a racing machine from the F-Zero series of games. The original Black Bull is used by the main antagonist of the series, Black Shadow. This is probably not a coincidence, as Sega developed the GameCube iteration of the racing franchise, which featured a story mode featuring the character. This page was last edited on 31 October 2017, at 18:24.